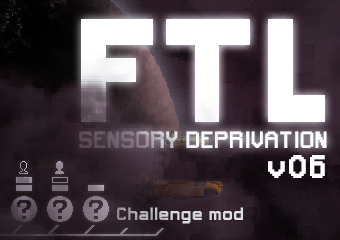 Sensory Deprivation, or SensDep, is a small, highly-compatible visual/textual modification for FTL. It doesn't change any ships, events or weapons, but, by hiding select information, forces players to rely far more heavily on memory, diligence, and trial and error. System room icons are removed, making it harder to track damage on your own ship, and more difficult to locate targets during battle. You'll need to pay close attention to your enemies to know exactly which systems they're using. Trust me, you probably don't. And even if you do, there's a few tweaks and modifiers included in the download pack to let you customize the challenge. There's even a solution to your very problem - more detail after the download link. Y'know... I like to leave a few surprises for people - Maybe just try it and find out? Or check out some let's plays if you really want to know what's in store for you. Sensory Deprivation is currently available on ModDB. There's also a whole bunch of actual screenshots there if you wanna check them out. SensDep should be loaded with the latest Slipstream Mod manager. The mod is designed to be highly compatible, and can be used alongside other mods. For best results, make sure SensDep is loaded after any other mods. Should you wish to use any of the mod's tweaks or addons, they should be placed after the Core Mod. 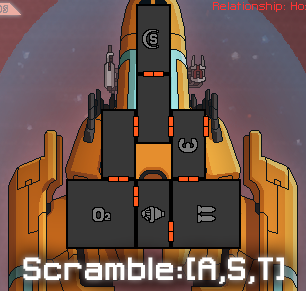 The Ship Scrambler pack allows you to randomize the layout of enemy ships. This doesn't effect load-outs, only layouts; an Auto-Scout will still only ever have Piloting, Engines, Weapons, Shields and/or Cloaking, but the scrambler changes where they're located. The new locations aren't persistent between factions - Auto-Surveyors' piloting rooms won't be where the Scouts' are - but all ships of the same class will share the new layout, which may be some comfort. The Pack contains 5 Scramble Varients; A, E, R, S, and T.
You can use as many or as few as you like, even re-order them; each time getting a different result (up to 325 variations!). This way, you can share experiences with other players, and also report bugs easier should they occur. The Halloween pack, Scared Senseless, is still included, but as it's now December I've stopped using that as a main selling point. There's also a few tweaks to the Core Mod, including a new Title Screen! Go! Now! What are you waiting for!? Anistuffs' SD Playlist, where he aims to beat the game with every ship while inflicted with this mod! Styles also just did another run with v06 attempting a Boarding Stratergy - it's pretty brilliant! I'm also making a small gallery of Gifs on Imgur from the let's plays mentioned above. Last edited by Gencool on Tue Mar 15, 2016 10:58 am, edited 29 times in total. That health bar trick is exceedingly cruel. Anyway, reddit user mekloz did a run and posted a picture album and a commentwith their observations. Now, I was planning to LP this but I noticed that mekloz pointed out some typos so I delved into the code and found some more. 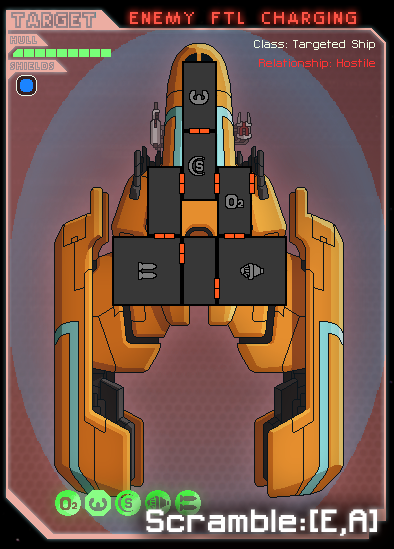 In the misc.xml.append file, in the <!-- Misc tooltips that can't be in tooltips.xml because they are dynamic --> section, almost all the mouseover text line has the sentence "The is a defensive/offensive/ship system" which should be "There is a defensive/offensive/ship system". And the other typo (well, it's not a typo but more of a discrepancy) was pointed out by mekloz in their album. In the tooltips.xml.append file, in the <!-- System tooltips FOR THE ENEMY --> section, the teleporter tooltip is different from the other tooltips. You may want to change that to be uniform with the other tooltips. Anistuffs - The Indian Let's Player. When I'm done with the Arwing and the one planned after that naturally. Guess I"ll have to dust of the Randtrell mod once more. I mean hiding the icons is a great idea and all that, but seasoned veterans know where the shields and such are on their ship. And to some extent on the enemy ones as well. Feel free to ignore my rambles though. Styles- looking forward as always! Can you append specific flags in tags w/o changing the whole tag? 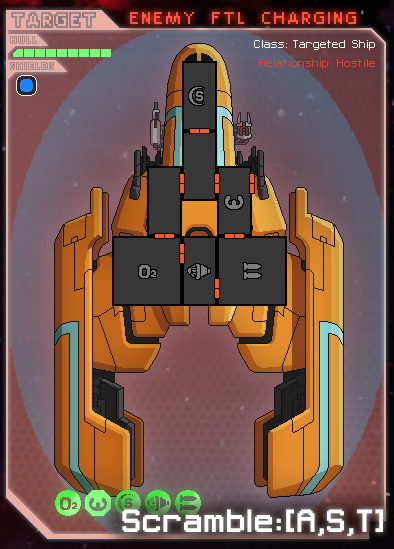 Maybe I could search ship bps which contain room tags with two specific numbers, (eg 1 and 4) then swap those numbers. Do this w/ all numbers up to ten, make four or five variants and have players load them in whatever order they like. That should about do it. Gencool wrote: Can you append specific flags in tags w/o changing the whole tag? I think you can easily use mod:selector and mod:setAttributes for this. Not sure if stuff like room 'direction' and 'number' won't give you any trouble (this is manning?). Anyway, I wasn't sure if you read reddit, either, but saw another ship of yours with the same poster, so I just wrote there, hope you don't mind. Great stuff, really fun. Oh, and I think making it too difficult might take away from it - right now, you have to pay attention and see what's happening, but if you erase too much, you're just asking for people to get hacking and have an easy guess anyway. Edit 2: As I mentioned in my previous comment, you should change the xml.append files to xml.rawappend. 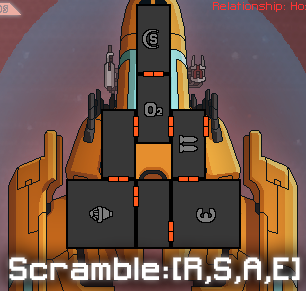 I noticed a ton of text spacing issues in my run. Here's me and Katatonik trying out the mod, combined with the Ship Randomiser for that extra Hard Mode Challenge. I could make the game even harder by having a random, Captain's Edition ship, combined with CE and Scared Senseless Sensory Deprivation, although that might be for a Halloween Special or something. Thank you for point out the rawappend, I honestly didn't know that that was a thing! 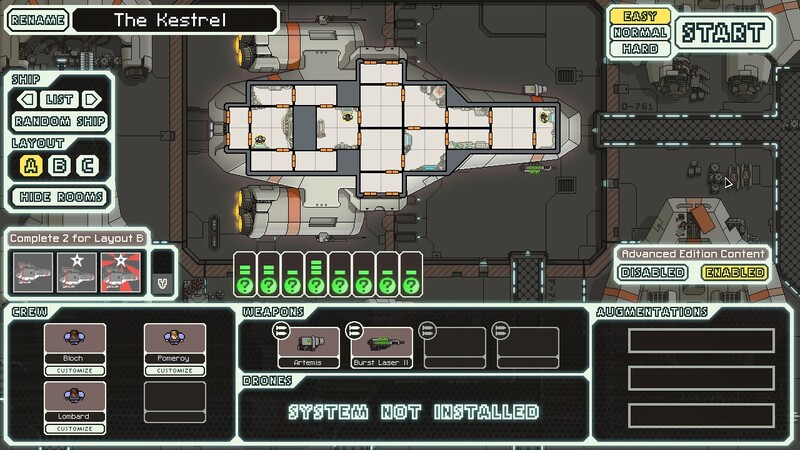 I suppose I could just have the Hacking tell you if there's a system there or not? Is that too much of a nerf? Also, yeah, I figured leaving the systems visible was pretty fair. Ditto for the consoles on the enemy ship. Good call - save me from myself! Ani - That's awesome! Picked up on the stuff you mentioned in the video and just released a new update on ModDb. Gotta say, I'd have picked the preignite too (shame about the next jump) and the drone hit at the end! Perfect! Styles - Mwahaha! 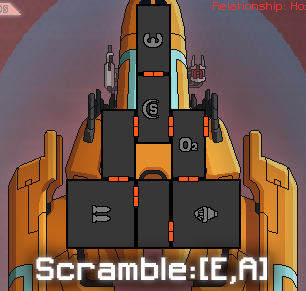 I was hoping someone would go up against the random Flagship. Love the use of the Randtrel, hadn't even considered that! Oh, and Scared Senseless is just a different icon pack, it doesn't make anything more or less difficult, just, as Bio would say, SpOoOoKy. I was trying to find whether the ship has systems in room "0" and "1", and then swap those numbers. 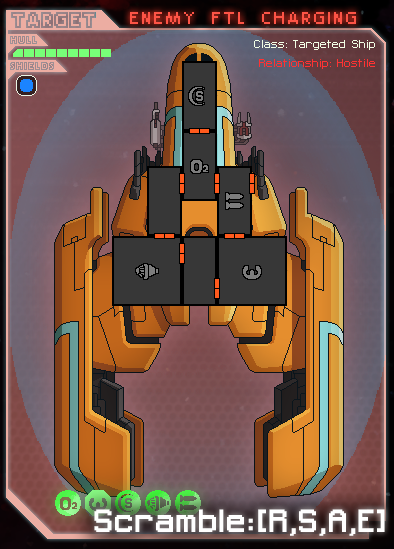 The idea being that this way the code won't introduce numbers higher than the ship actually has, and that loadouts would be unchanged. Thing is, not only does it not swap systems, but the class name doesn't even change. The file's placed and named correctly... I'm at a loss. Last edited by Gencool on Thu Oct 08, 2015 10:34 am, edited 2 times in total.